“An ancient stone circle that has remained unknown to archaeologists for thousands of years has been officially recognised,” reads the intro of an article from the Press and Journal, Scotland’s oldest newspaper. 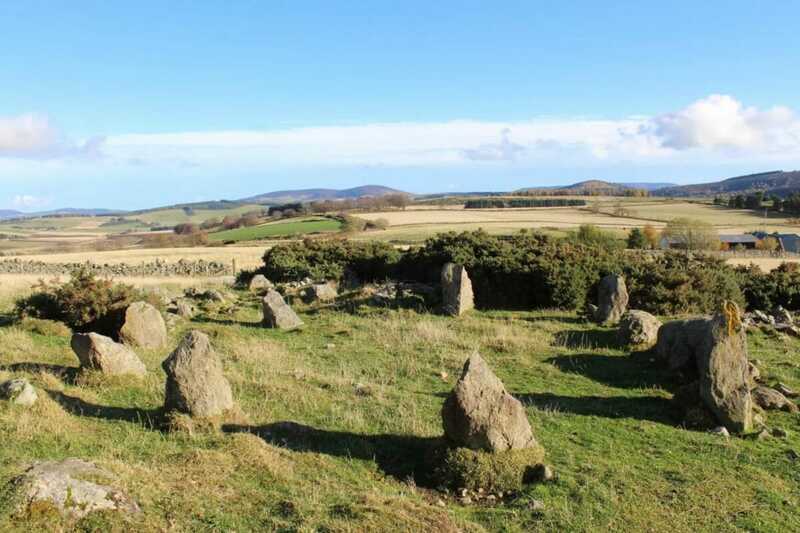 The article, published in late December of 2018, announced the finding of a stone circle on a farm in Aberdeenshire, Scotland. Stone circles of this type are rare but endemic to this part of Scotland, and archaeologists noted that they date from between 3,500 and 4,500 years ago. A great find! Except, well, it isn’t. Stone circles of this sort, which typically include one stone laying on its side, are found only in this part of Scotland; about 90 have been discovered. The stone laying on its side is called a recumbent stone, usually placed facing southeast or southwest, and sits beside two upright stones. There are many stone circles throughout the UK, some of which are grand and upright, some smaller and more humble. The original purpose of the circles remains unknown, though there are plenty of theories about possible ceremonial uses. The Press and Journal article noted that the Aberdeenshire circle was a little unusual. It measured at about ten feet smaller than most stone circles, and the article also mentioned that it is rare to find a complete and unknown stone circle in Scotland. But, hey, unusual might just mean unusual. After the article was published, a former owner of the farm reached out to Historic Environment Scotland, the organization that recorded the site, to say, well, that they had it wrong. This stone circle wasn’t an ancient remnant of past Scotland; in fact, the farmer had built it himself in the mid-1990s. The archaeologists seem to be taking this all in good faith, writing in a press release that the farmer’s skill in creating this replica is exceptional. “That it so closely copies a regional monument type shows the local knowledge, appreciation and engagement with the archaeology of the region by the local community,” said Neil Ackerman of the Aberdeenshire Council in the release. Whoops! But also, nice work. This has always puzzled me about archeology. If I buy a civil war relic and bury it in a Peruvian cave to be found 30 years from now, will I read publications about how exiled soldiers must have made it to Peru? Great article. I was a grad student in Reno in the 1990s, working on long-ish changes in desert vegetation. One of the best sources of info is pack rat middens, which go back tens of thousands of years and incorporate whatever was growing there at the time. We fantasized about driving a pipe into the famous “Mother Midden”, pulling the pipe and core sample, dropping a Champion spark plug in to perhaps the 30.000 year level, and reinserting the core. I am not the only one who really misses The Far Side [Gary Larson]. And Calvin and Hobbes. I enjoyed the aromatic woody perennial herb article. Do you publish for subscriptions?